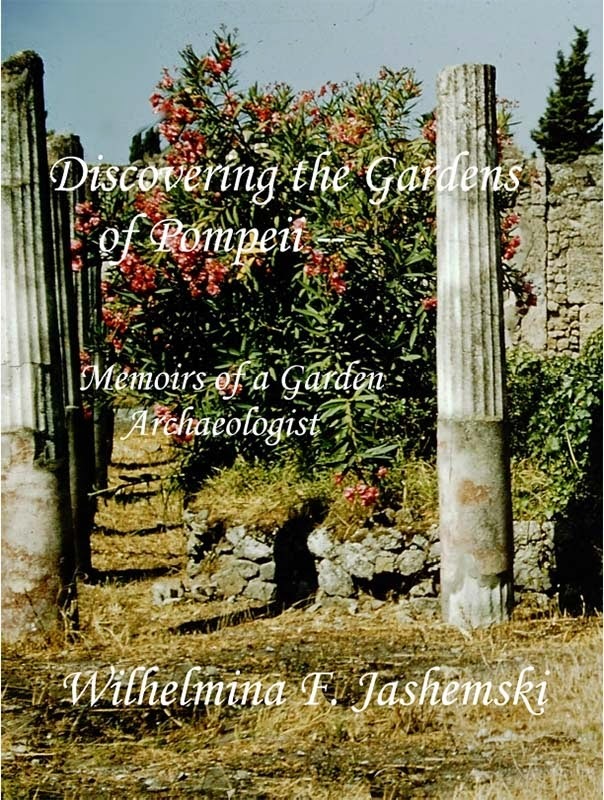 We have recently acquired a copy of the new book “Discovering the Gardens of Pompeii: Memoirs of a Garden Archaeologist: Wilhelmina F. Jashemski". What a beautiful addition to the bookshelf. This new book has 336 pages and contains 400 of Stanley’s original photographs. It is available from your local Amazon in the USA, UK, France or Italy, in colour for the local equivalent of US$40, about GBP 17.31, Eur 35.99 or in a black and white edition for US$20. It uses the Create Space Independent Publishing Platform a low cost print on demand option which you may find of use for your own work in the future. In addition to the gardens of Pompeii are her memories of her trips all over Europe and wherever there might be a roman garden, from her home in America starting from 1955 until 2004. These memoirs will take the reader on a journey to Pompeii and across Europe, France, Switzerland, Italy, Austria, Germany, Poland, and Greece alongside Wilhelmina and Stanley. She had the idea of trying to prove what plants would have been in roman gardens, and write a book on the gardens of the Roman Empire, of which a chapter would be on Pompeii. She told Tatiana Warscher this when she first met her, and that she thought that all the gardens of Pompeii would have already been published. She remembered vividly the tart reply “Only the picture postcard stuff”. Tatiana looked her straight in the eye and said “My dear girl; your first book will be on the gardens of Pompeii”. Tatiana Warscher had been given her own key to all the Pompeii houses, so they were able to go anywhere they wanted, just by unlocking the gate of any house and gaining access. [Oh, what a boon!]. As they worked together day after day studying house after house, garden after garden, large and small and with many features, she began to realise the truth of what Mrs Warscher was telling her, and the single chapter became the three large volumes on Pompeii for which she is famous. There are many stories and anecdotes in the book which the reader will find very amusing. Her memories of Pompeii in the late 1950’s and 60’s brought back happy memories for Jackie, of when she first visited there in 1967 and 1968. Life seemed much simpler then, and it shows in the photos, roads with only a few cars, houses without all the modern day trappings – just the necessities, and happy friendly faces at work on the excavations. Faces that became Wilhelmina’s friends, and looked after her, even after Stanley died which left her devastated. 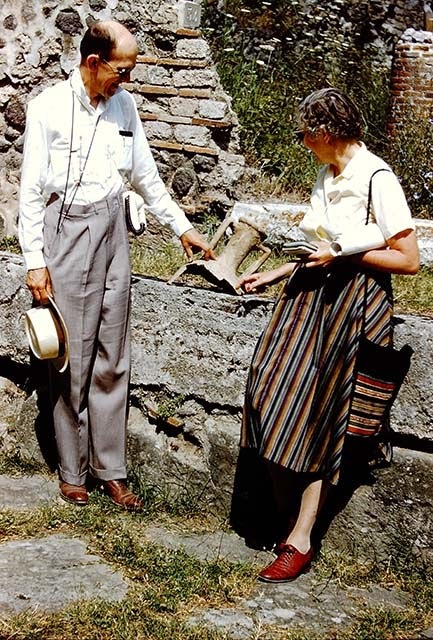 Without their friendship, she probably wouldn’t have been able to carry on with what became her lifetime’s work, and a boon to all archaeologists, gardeners, and of course, anyone just interested in the area of Pompeii and surrounds. This book will be a positive read for anyone interested In Pompeii, gardens, history and roman archaeology, and at the same time being an inspiration for those with an idea to just get out there and make it happen. Her itinerary of the days spent in the area are detailed and informative recording the visits, excavations, the publishing of the books and the many people involved along the way. Wilhelmina and Stanley in 1959. This book is a lasting tribute to Wilhelmina, her husband, her colleagues and friends, and her very interesting life. It has been made possible by the tireless work of her friend Clopper Almon. He visited Wilhelmina regularly in the years just before she died, and collaborated closely with her to finish her memoirs for publication. After her death, he has now kept her wish for greater access to the memoirs and photographs by publishing this book, and making sure the photographs are well looked after, documented and accessible. We are also honoured to have been given permission to include Stanley’s Pompeii photos on pompeiiinpictures. We have started to sort them out into the Pompeii addresses, and eventually they will be a lasting remembrance both of Stanley and Wilhelmina and the friends she knew at the Scavi, and of course, Wilhelmina’s friend and mentor, Tatiana Warscher.